SculpSure™ is a non-invasive body contouring method that’s designed to quickly and effectively eliminate excess body fat throughout the body. It’s the world’s first FDA-cleared laser treatment for lipolysis (the breakdown of fats), and it can be used on fat in the abdomen, flanks, back, thighs, and even under the chin. Unlike traditional liposuction procedures, no scalpel or knife is needed, and downtime is non-existent. 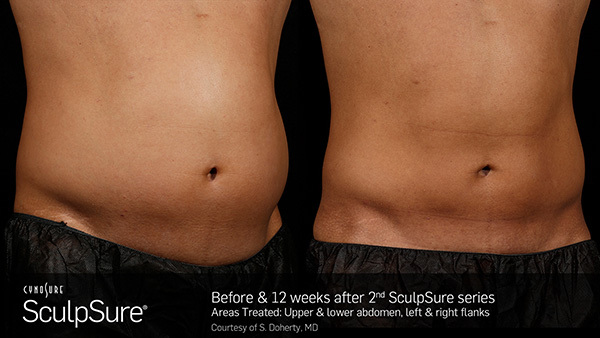 Sculpsure’s 1060nm wavelength technology has a high affinity for adipose tissue. The laser raises the temperature of adipose cells between 42° and 47° C, damaging their structural integrity. Over the next three months, the body naturally eliminates the disrupted fat cells. Disrupted fat cells are permanently eliminated from the body and will not regenerate. Plenty of weight loss products claim to “melt fat away,” but everyone knows that’s simply a marketing term. But SculpSure™ actually achieves that. It uses a laser and a specific wavelength of energy that’s designed to specifically target adipose tissue, or fat. Because the wavelength passes safely through the skin without being absorbed, virtually all of the energy of the laser is absorbed by the targeted fat cells. In just 25 minutes, the procedure causes fat cells to raise between 42 degrees and 47 degrees Celsius, while simultaneously cooling the skin. That rise in temperature in adipose tissue cells causes them to become unstable and lose their structural integrity. As the cells begin to break down over the ensuing hours, days, and weeks, the body eliminates them naturally. Most diet and exercise programs are only effective at shrinking fat cells, which means they can and often do quickly re-expand when a person stops dieting or lowers their activity level. But because SculpSure™ causes fat cells to be eliminated from the body, people who have had the treatment are less likely to regain excess fat in the targeted areas. Although a single treatment is effective at reducing fat cell count, multiple treatments are often recommended for patients to reach their goal physiques. Visible results are obvious by six weeks after initial treatments, and maximum fat reduction occurs within 12 weeks of treatments. 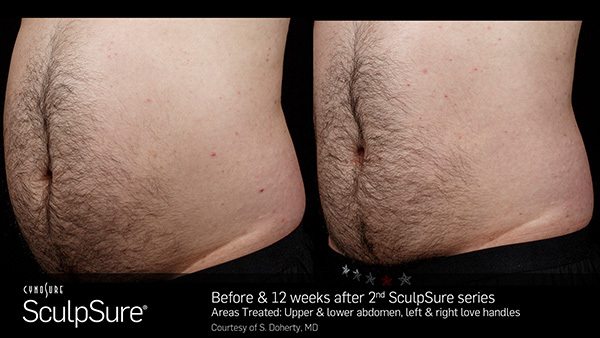 SculpSure™ utilizes versatile applicators, which means it can be comfortably used on a variety of body types and across a variety of body surfaces. In addition, it’s FDA-cleared for patients with BMIs of up to 43.